We all vote on which cause to support. The top vote-getting charity then receives all the checks, made out to them on the spot! On each of four nights during the year, these 100 Women Who Care give up to $10,000 to a local charity, non-profit, or worthy cause, right here in the Santa Cruz County community. It’s fast, simple, and amazingly effective. We invite you to attend any time as a guest to see how it works and decide if the group is right for you. We each donate $100 per meeting (That comes out to just over $1 a day each year). 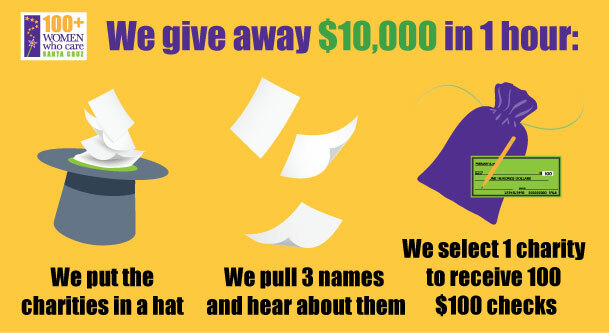 Each of the three charities selected from the hat will be given 5 minutes to make a presentation at the meeting. This presentation must be made by a member of the 100 Women Who Care, who may or may not be a member of the organization. If you are unable to attend any given meeting during the year, please give your check to a member to deliver on your behalf, or mail your $100 check made out to the selected charity to: Diane Lamotte, 604 Middlefield Drive, Aptos CA 95003. By ballot, the group will vote, and the majority rules. Even if you don’t care for the choice, you still must donate. All checks go to one charity. No national charities will be considered, however, local branches of national charities are eligible for consideration. The purpose is for 100% of the contribution to stay in Santa Cruz County.